At the turn of the 19th century, the upheaval of the “Reign of Terror” and Napoleonic Wars resulted in a worldwide rise in gold prices. 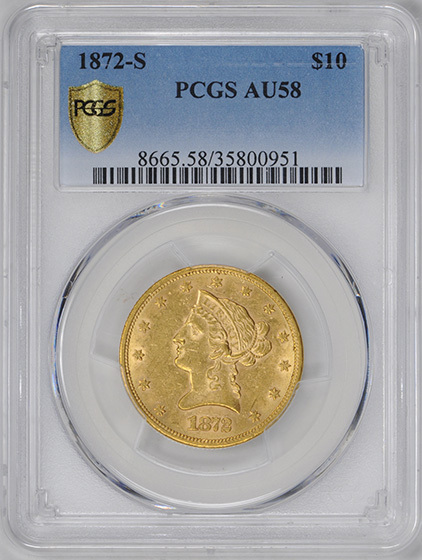 With the U.S. Mint statutorily bound to the weight specifications and 15 to 1 silver/gold ratio defined by the Act of 1792, the fluctuating market price of precious metals wreaked havoc with U.S. coinage, particularly the largest gold coin, the flagship $10 Capped Bust “Eagle.” By 1795, an ounce of gold—worth 15 ounces of silver in the United States—was worth 15.5 ounces of silver in Paris. That was enough motivation for bullion brokers to buy United States gold coins, mostly with Latin American silver coins, and ship them to Paris to be sold. By 1813 the ratio would reach 16.25:1, and before long, 98% of all U.S. gold coinage would be destroyed. At the end of 1804, President Thomas Jefferson ordered eagle production stopped. It would be 34 years before production resumed. It wasn’t supposed to be that way. Years before, Alexander Hamilton had envisioned a monetary standard where coins of other metals would be simply a convenience, and only gold would be legal tender. He believed gold to be the most price-stable of the precious metals and less sensitive to changes in supply. Congress thought his idea to be utopian and idealistic. In the 1790s, gold was scarce, but silver coins, especially from Latin America, were plentiful. Fortunately, Congress settled on a bimetallic standard. At least silver coins, even if they were foreign silver coins, gave the new Republic a ready supply of money for commerce. 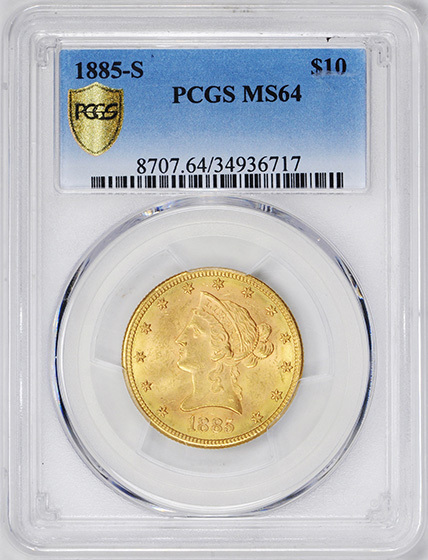 It ultimately took two separate Congressional Acts, that by 1838, adjusted the content and fineness of U.S. gold coins enough to allow them to remain in circulation. Mint Director Robert M. Patterson was instructed to produce eagles, and Acting Engraver Christian Gobrecht, replacing the ailing William Kneass, prepared dies for a new design. Gobrecht’s design, inspired by the portrait of Venus in Benjamin West’s Painting Omnia Vincit Amor (Love Conquers All), also became the prototype for the half-eagle and large cent of 1839. It features a bust of Liberty facing left, wearing a coronet inscribed LIBERTY. Her hair is knotted in the back with hang- ing curls. Thirteen stars encircle the bust, with the date positioned below. The reverse depicts an eagle holding an olive branch and arrows, surrounded by the inscriptions UNITED STATES OF AMERICA and TEN D. Mintmarks are below the eagle. The first coins, those of 1838 and early 1839, are distinctly different than subsequent issues: Each has Liberty’s shoulder line sharply pointed and positioned between the twelfth and thirteenth star. In the fall of 1839, Gobrecht reworked the bust and centered it over the date. This design—with the exception of the added motto in 1866—remained basically unchanged until the end of the Coronet series in 1907, when it was replaced by Augustus Saint Gaudens’ Indian Head motif. Unfortunately for collectors, the first years of the new coin’s run, from about 1838 to 1844, were during the depression and “Hard Times” of the Jacksonian era. An eagle was a substantial sum, worth in goods then what a half ounce of gold would buy today. 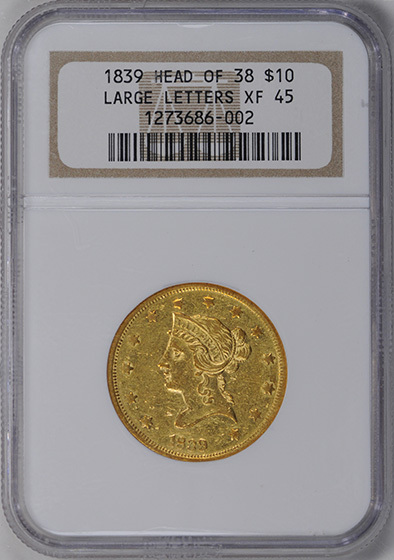 There was little demand for the large coin in everyday use, thus the mintage of the new Coronet eagles (identified colloquially by collectors today as “No Motto Ten-Libs”) was limited. By the 1850’s, when economic conditions improved, demand for the eagles remained low, since half eagles were preferred in day-to-day commerce, and the new double eagles were used in bank transfers and international transactions. Struck in Philadelphia (no mintmark) every year of the series, No Motto eagles were also minted in New Orleans (O) from 1841 through 1860, and in San Francisco (S) from 1854 through 1866. About 5.3 million business strikes and 400 proofs were made, but unfortunately, few were preserved. Mintages were small and most survivors didn’t make it past the recall and meltings of the 1930s. As a result, it is difficult to find high grade specimens of any date in the series. 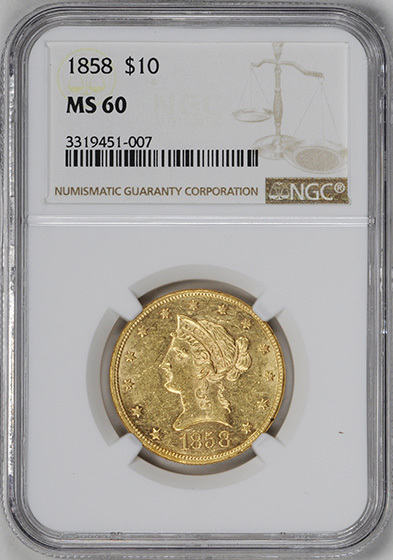 There are no “common-dates” in uncirculated condition—every issue is rare, and only a handful even approach the grade of MS-65. Superb pieces occasionally appear, but almost exclusively in sales of the largest and most famous collections. Although few individuals attempt to assemble complete date and mintmark sets, some pursue the issues from a single mint, or one from each mint. A collection of New Orleans eagles—paralleling the two decades leading up to the Civil War and the Confederacy’s seizure of the branch there—consists of twenty coins. A San Francisco set, tracing the first eagles struck at the new mint—from the Gold Rush days to the end of the Civil War—entails just thirteen pieces. Most collectors however, are content to find just one high-grade specimen for their type sets. Numismatists anxiously await a complete inventory of the fortune in gold coins found aboard the wreck of the S.S. Central America in 1987. The ship was lost off the South Carolina coast in an 1857 hurricane while carrying over 1.2 million dollars in gold. 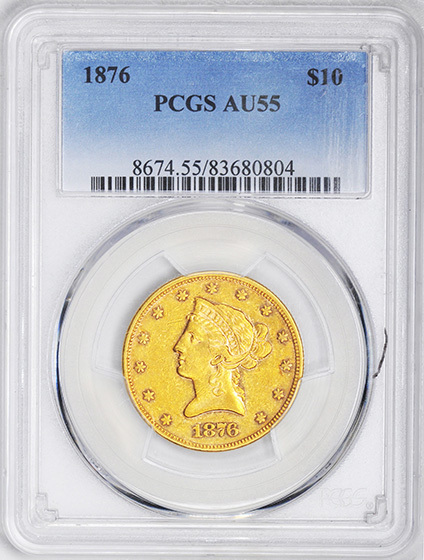 Many coins recovered to date are in pristine condition, most notably 1857-S double eagles. Perhaps early S-Mint eagles will also be found. No Motto eagles are not difficult to grade. Look for traces of wear on the top of the coronet over Liberty’s forehead, on the top of her hair and just over her eye. On the reverse, check the tips of the eagle’s wings, neck and claws. Unfortunately, well made twentieth century counterfeits exist. 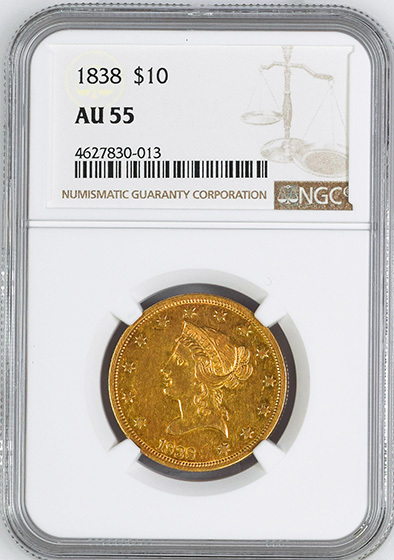 Originally made in the Middle East as a way of producing bullion in a recognizable form, many have found their way into the numismatic market. 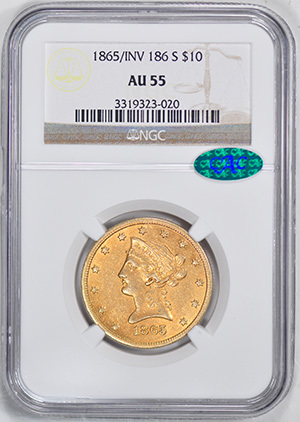 The very rare 1858 Philadelphia issue has also been counterfeited, usually by removing the mintmarks from San Francisco or New Orleans coins of that year. Authentication of any questionable piece is highly recommended. The Coronet eagle continued to be minted until 1907 with only one major change to the design. The carnage of the Civil War and the terrible upheaval that followed found the population of the country in a religious and philosophical mood. A desire to nationally express this feeling led to the addition of the motto IN GOD WE TRUST to U.S. coins. First used on the two-cent piece of 1864, the motto was added to the Coronet eagle in 1866, inscribed on a ribbon over the eagle’s head. Collectors were slow to seek out Coronet eagles by date and mint. 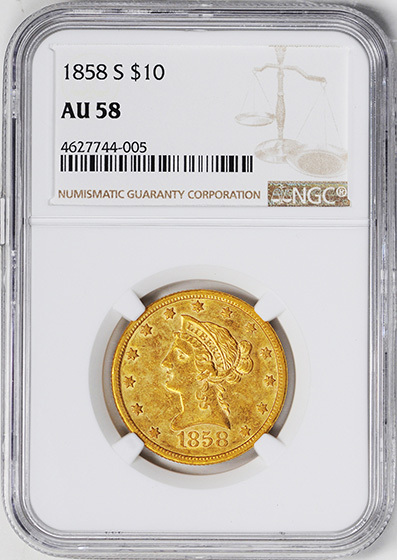 While proofs were purchased regularly by a handful of numismatists from 1858 onward, most of the branch mint pieces, as well as non-proofs from the Philadelphia Mint, were placed into general circulation. There they became worn, and many were later melted. Perhaps the only complete series of these pieces was that assembled by Louis Eliasberg, Sr. and sold at auction in 1982. 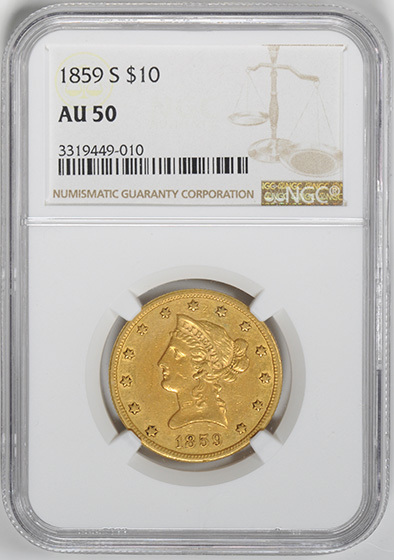 Although the $10 “eagle” was the largest gold coin issued under the Mint Act of 1792, it would be over forty years before most citizens would see this “Flagship” denomination. First minted in 1795, Congress’ ill-conceived 15 to 1 silver/gold ratio doomed the coins—and their smaller brothers—to hoarding and melting from the start. The result was inevitable. Eagle production ended in 1804, quarter eagle mintages remained minute, and only half eagles were made in quantity, primarily for transactions between banks. Many still succumbed to European melting. Finally, in an effort to return gold coins to the channels of commerce, Congress passed the Act of 1834, changing the silver/gold ratio to 16 to 1. Almost overnight, U.S. silver coins were worth more than the equivalent amount in gold coins. At that point gold coins reentered circulation in abundance. The favorable price the U.S. paid for gold—vis-à-vis silver—guaranteed the Mint a continuous supply of the yellow metal that would last for years. 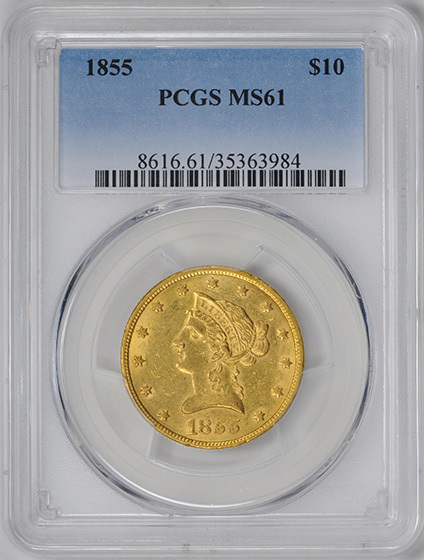 The California Gold Rush only fueled more production, and made gold coins familiar across the land. But the Civil War would change all that, as it would change everything in America, including the coins themselves. 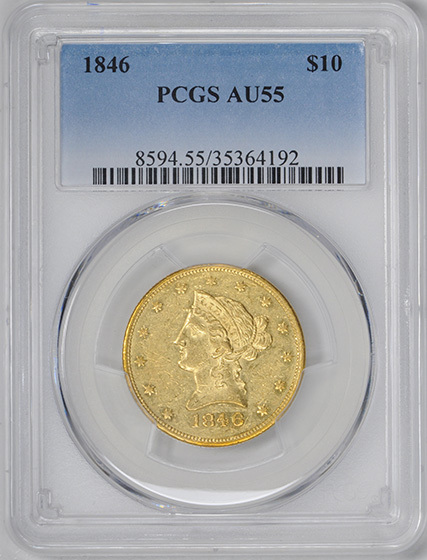 At the beginning of the war, hoarders and speculators saw to it that gold coins again vanished from public view, including the eagle, reintroduced in 1838 after a 34-year hiatus. As battles raged, and one side or the other proved victorious, confidence in paper currency quickly faded. 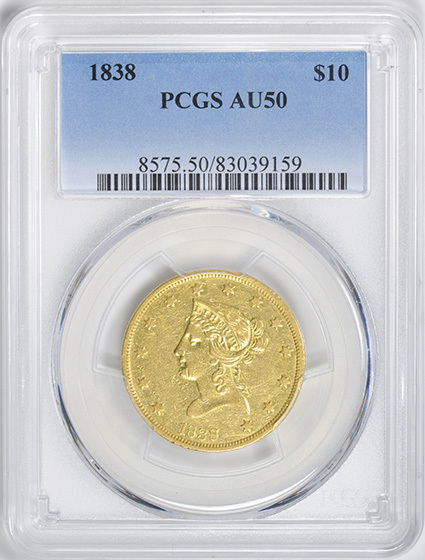 Soon the gold eagle was worth 20 percent or more over face value in Federal “greenbacks.” As the war progressed—with casualty rates of more than 80 percent and the decimation of entire regiments—the nation as a whole experienced a spiritual revival. The somber and reflective mood of America was as deep as the scars of the war, and it seeped into every facet of daily life. The eagle issued since 1838 was the Christian Gobrecht designed Coronet Head, featuring a neoclassic head of Liberty adorned with a coronet inscribed LIBERTY. 13 stars surround the bust, with the date below. The reverse depicts an eagle holding arrows and an olive branch, encircled by the inscriptions UNITED STATES OF AMERICA and TEN D. Chief Engraver James Barton Longacre placed the new motto on a scroll over the eagle’s head. From 1866 through 1869, only Philadelphia (no mintmark) and the increasingly important San Francisco (S) branch struck this new design. Production began at Carson City, Nevada (CC), in 1870 and continued through 1893. New Orleans (O) coins appeared in 1879, and the new Denver (D) facility began mintage in 1906. Mintmarks are found on the reverse, below the eagle. In considering the rarity of Coronet eagles with motto, it’s apparent that limited mintages went hand in hand with collector disinterest in pieces of such high face value. 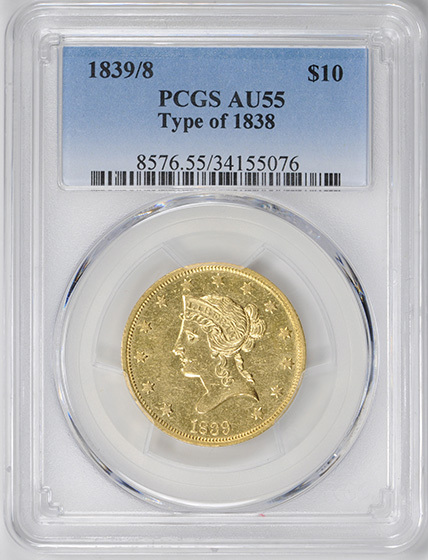 Relatively few coins were struck, but there were even fewer collectors interested in gold coins by date. Nor is low mintage the only guide to rarity. Some dates with relatively high figures are substantially scarcer today than their published totals might suggest. The 1888 Eagle is a case in point. Though 132,973 business strikes were produced, the coin is elusive in any grade and virtually unknown in mint state. With the exception of 1901-S, and to a lesser extent, the 1901, all issues of this series are RARE in gem uncirculated, limiting type collectors to only the occasional appearance of other dates. Infrequently, one-of-a-kind superb pieces surface in “name” collections, like the amazing 1899-O or 1901-O (among many others) from the Eliasberg estate. The series contains enough major rarities that alterations are seen with regularity. 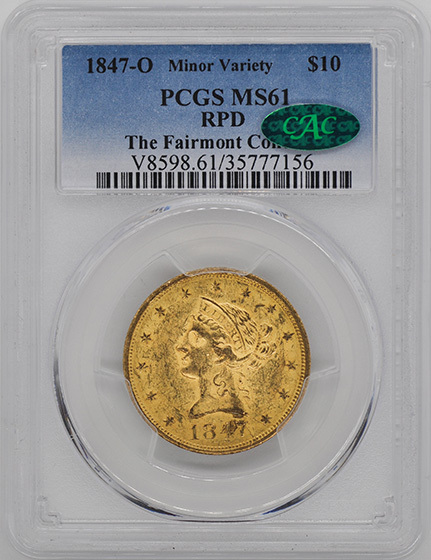 Since several of the most elusive issues were struck in Philadelphia, mintmark removal has been attempted to simulate Philadelphia strikes of 1873, 1875, 1876 and 1877. Counterfeits also exist of other dates, many made in the Middle East. Authentication of questionable specimens is highly recommended. When grading this design, look for traces of wear on the top of the coronet over Liberty’s forehead, on the top of her hair and just over her eye. On the reverse, check the tips of the eagle’s wings, neck and claws. 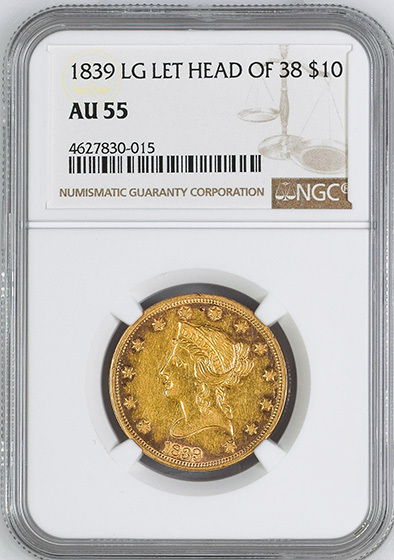 While describing the degree of wear is straightforward enough, severe bag-marking and abrasion are major problems on many of these large and heavy coins. Often, deep mint frost remains, painfully highlighted by a forest of contact tics, reeding marks and scuffing. In 1907, the Coronet Head design was replaced by the Teddy Roosevelt inspired and Augustus Saint-Gaudens created Indian Head motif. 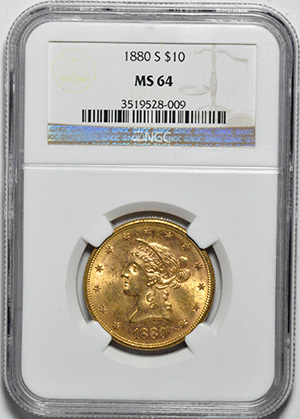 It would be minted until the end of U.S. gold coinage in 1933. CHOICE VERY LUSTEROUS AU. JUST A SINGLE MS61 GRADED HIGHER. VERY SCARCE DATE. ONLY 20,095 STRUCK. 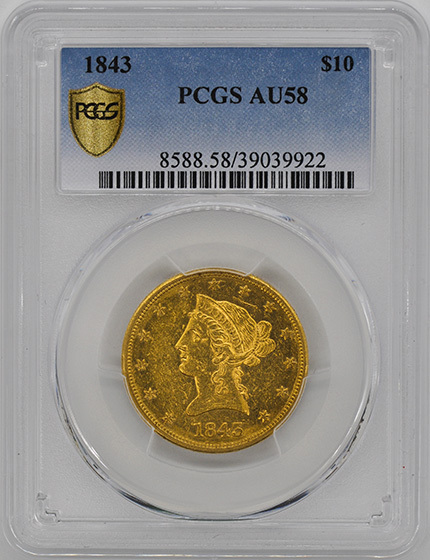 JUST 5 HIGHER AT PCGS. REPUNCHED DATE. VERY SCARCE IN MINT STATE. CAC. VERY SCARCE. LUSTROUS. ONLY 2,521 STRUCK. 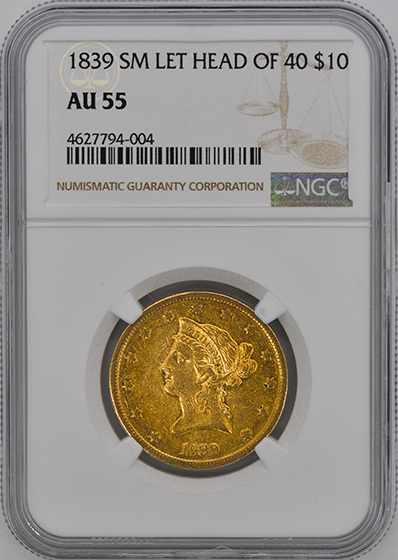 JUST ONE GRADED COIN GRADED HIGHER AT NGC. CHOICE LUSTEROUS SURFACES. JUST 60-80 KNOWN. TIED FOR HIGHEST GRADED. WELL STRUCK. ONLY 7,000 MINTED. VERY SCARCE. ONLY 10,630 STRUCK. TIED WITH 1 OTHER COIN FOR HIGHEST GRADED. SATIN LUSTEROUS SURFACES. 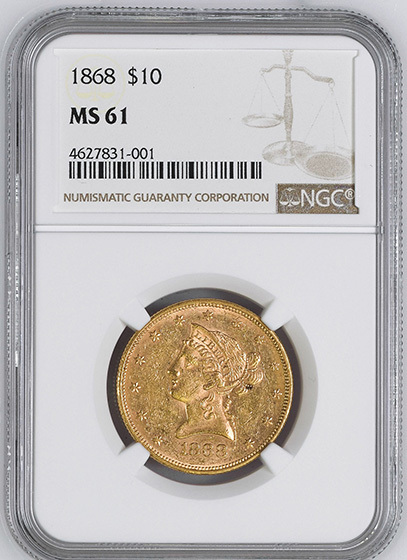 ONLY A SINGLE MS60 GRADED HIGHER AT PCGS. WELL STRUCK AND LUSTEROUS. ONLY 10,000 STRUCK. 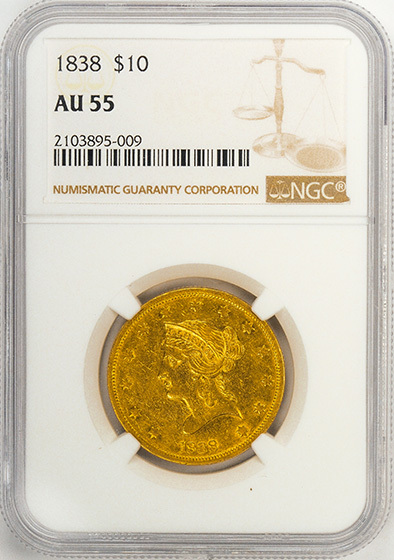 ONLY A SINGLE MS61 COIN GRADED HIGHER. VERY RARE. ONLY 687 STRUCK. 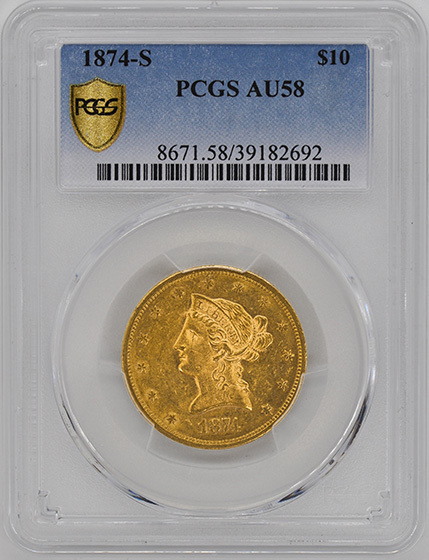 JUST FOUR COINS GRADED HIGHER AT PCGS. CHOICE LUSTEROUS SURFACES. TIED FOR HIGHEST GRADED. SATIN LUSTEROUS SURFACES. TIED FOR HIGHEST GRADED.